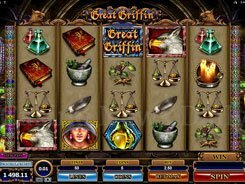 The 5-reel 25-payline Magic Spell slot will transport you to the Academy of Magic where feline students learn how to cast spells, brew potions and attract good luck. 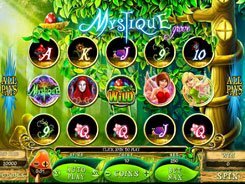 The ability to attract luck into your life comes in very handy when playing this slot, since Magic Spell offers up many ways to claim handsome awards. A coin size in the game ranges from $0.01 to $1. 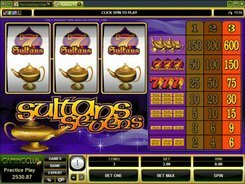 Choose the number of coins you would like to bet on each line (up to 10) or click Bet Max to wager the maximum coins on all paylines. 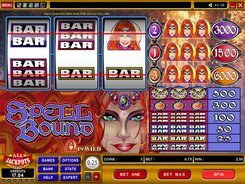 With betting limits of $0.01–$250 per spin, the game will suit both low-limit bettors and high rollers as well. 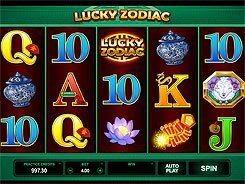 The top award of x2000 times a bet is granted for hitting five Leo symbols on a payline. The second and the third largest prizes are x1500 and x1000, for five Catrina and Baz symbols respectively. 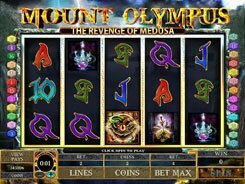 The slot features a wild symbol depicted my Master Tom that increases the payout by x5 when substituting for other icons. 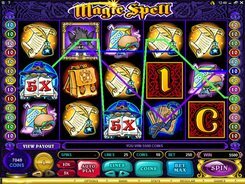 Perhaps the most amazing feature in the slot is the Magic Spell bonus triggered if the letters M, A, G, I and C land on reels 1, 2, 3, 4 and 5, accordingly. When assembled, these letters give you access to a secret library where you can hit up to $75,000. PLAY FOR REAL MONEY!